Blue gum perfect for an Australian wedding scene. So pretty! 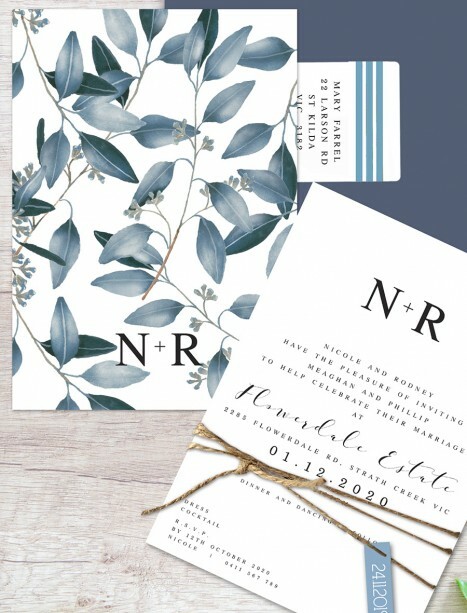 This sweet little double sided wedding invitation has so much charm. Change the feel by using mint, black, white or forrest green envelopes instead, please just request this at checkout or ask us on email. This design with all matching stationery items, wishing well, rsvp cards, menu, placecards, seating plans etc, please ask us for pics if you can't see them up on the site yet! The beauty of these flat cards is that we can also print a wishing well or information on the back for no extra fee if you'd like. Or we can do it as a seperate card if you'd prefer.